Today I bashed head first into a giant foam block tower a little girl was building. This made her very upset. But made me diabolically appeased. "You broke my tower. I wasn't done building that!" The bold little blondy whined in my face. "It's ok. You can build it again." I said politely and unsympathetically. oh I'm such a mean mommy. Today we visited the National Building Museum, an awesome cold weather destination. Basically a huge empty carpeted basilica. The exhibits line the perimeter of the building while the center hall is completely open. Kids can run around and tag each other without you having to worry about them breaking anything or begging you to buy them candy. There were a bunch of families with kids there. Kaio and Nala loved it. Mari took Kaio upstairs to see the Lego Building exhibit. The exhibits require an entrance fee, but general entrance into the museum is free. Kaio and Mari played in the Lego room for about an hour. They built a house and a helicopter. Sounded like fun. Nala and I kept in the general auditorium playing hide and seek, building things with the giant foam blocks they have out for kids to play with. Lots of kids were playing together, making and breaking towers on a regular basis. Like a playground, no rules or regulators governing their interactions. Just general organic child anarchy with the occasional intervention by parental units. I guess I'm not the best at intervening and policing. I let Nala push a boy a couple times before breaking the fight up. I trust her a bit too much. She's my sweet little baby. But, she's getting feisty, defending her castle against the boy who tried to take one of her blocks. Necessity spurs innovation. 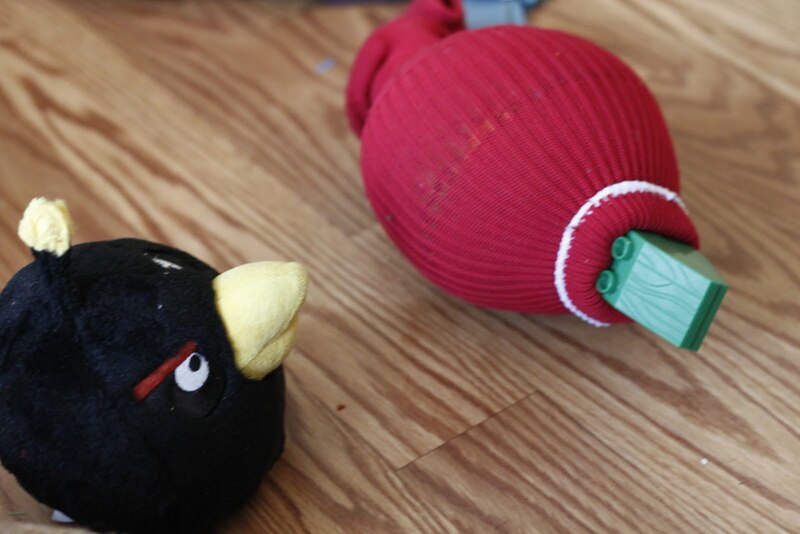 Kaio's red angry bird mysteriously flew the coop two days ago; disappeared. In desperation to make my boy happy, I got creative. Amazingly, he's really bonded with the little guy. When Kaio and Mari returned from the Lego exhibit we undertook the mission to create an arch from the blocks. Each block is labeled with a number indicating the order to stack them to build the arch. Kaio had his makeshift red angry bird in hand and was foaming at the mouth in anticipation of demolishing the arch with that bird. CRASH! the whole thing came a tumblin down. "NOOO!" Kaio cried out in disappointment and frustration. He made a feeble attempt to build it again, but that idea didn't seem to garner support with the rest of the kid troops, whom all had rushed to play with the fallen blocks. I tried to get the arch going again, but it was useless... like herding cats with yarn balls. The next best thing, he wanted to crash his angry bird into a four story tower a girl had just constructed. But she didn't want him to break it. "Don't destroy my tower." She demanded to Kaio. He proceeded to glide his angry bird in flight trajectory towards her structure. Mari and I interceded, "Kaio, she told you that she doesn't want you to break her tower." Then he really got upset and started to cry. "I want to go home." He said with a pitiful puckered lip. So we walked over to our stuff and put on our jackets to leave. The museum was closing in five minutes. I watched the tower as we gathered our things and the girl had basically deserted it. "Kaio, do you want to go break that tower with me?" A smile crept across his somber face and his eyes rose to meet mine, to see if I was serious. He took my hand and advanced across the wide open floor, fake running and pretending to fly, angry bird posed in front with aim on the target. POW! We knocked into it head first, not realizing there was a baby playing nearby. But the baby was ok... it's just soft foam. The girl, however, apparently was not done playing with her tower. "You broke my tower. I wasn't done building that!" She got up in my face. "It's ok. You can build it again." Surprisingly I didn't feel minimal urge to apologize. The place was about to close anyway. She'd stepped away from the structure. Kids had been knocking things over all day. "Consider it a natural disaster." I turned and said to the air. I walked away. Thinking that if her parents saw that, they might be thinking I'm a nasty evil mom who teaches her kids to destroy other kids' creations. They might be putting a voodoo curse on me right now. On the way out I mentioned to Mari the girl's reaction. "It's just karma." He responded. "She's the one who pushed the arch over before Kaio could break it with the angry bird. I saw her do this:" He acted out the little girl slyly bumping with her hip and then making a surprised/oops-face. ahh. no wonder it felt so good to bust her tower. That was the sweet taste of revenge. Now I want to go play in the Lego room, though that arch does look like fun! And that girl totally got what was coming to her!